In our last poll, we asked you about the usefulness of podcasts in your business. Nearly 43 percent said they found podcasts really useful; 29 percent said the quality and quantity of podcasts hadn't yet met their needs, while 14 percent each said they found them either occasionally helpful or didn't use them at all. 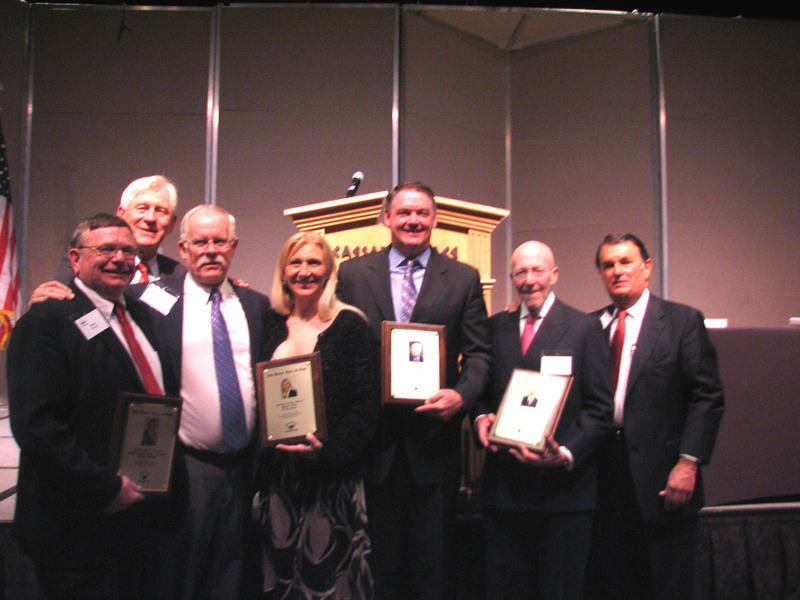 Sky Ranch honors "Class of 07"
At its 16th annual Hall of Fame dinner on Sunday, March 4, 2007, the Sky Ranch Foundation honored individuals whose personal and business achievements have made an important contribution to the united efforts of the alcohol beverage industry to provide quality care for the troubled teens at Sky Ranch for Boys. Supplier: Christine Heller - Bacardi U.S.A.
Allied: Tim Condron - Future Brands LLC & Elmhurst, Illinois “Kickoff for Kids”. Also honored at the dinner was Duncan Cameron, Treasurer & Administrator of Sky Ranch Foundation who was named the Mentor of the Year by Bill Slone of Beverage Media. Sky Ranch Foundation has enlisted numerous industry executives to mentor Sky Ranch boys. Duncan Cameron was recognized for his many years of service to Sky Ranch Foundation. The highlight of the evening came when Linda and William Hayes, representing the Bardstown, Kentucky chapter of WAABI (World Association of the Alcohol Beverage Industries) presented a donation of $115,000, made possible by the chapter’s very successful 11th annual Golf Classic last Fall. Honoree Tim Condron also presented a check for $10,000 from the Elmhurst Children’s Assistance Foundation. Sky Ranch for Boys, which celebrated its 46th anniversary in 2006, is a unique 3,000-acre facility on the South Dakota/Montana border where troubled kids from all parts of America get a second chance and a fresh start. Sky Ranch has built an enviable record over the years as it focuses on teaching kids to respect themselves and others. Through sports, arts, working with animals and even learning to fly a small plane, Sky Ranch helps kids find their natural gifts and take pride in them. Most boys advance at least 2 years in the grade level of their academic work during a one-year stay at Sky Ranch. In 1961, members and friends of the alcohol beverage industry at all levels agreed to support the development of Sky Ranch. They formed the Sky Ranch Foundation, which has purchased the land, built the buildings, and provided annual cash support equal to 25 percent of the Sky Ranch budget. This 40+ year tradition has earned Sky Ranch the nickname, “the adopted charity of the alcohol beverage industry.” More than $17 million has been raised to help Sky Ranch since 1960. For more information visit their web site. 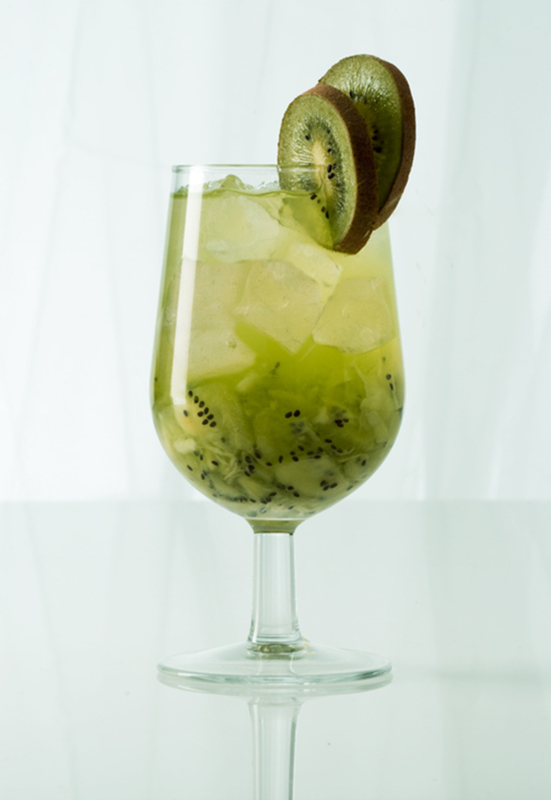 Peel the kiwi skin, muddle fresh kiwi with crushed ice, add Bombay Sapphire gin and Apple Pucker Schnapps, shake and pour it into the glass. Add splash of Sprite on top. Decorate with fresh kiwi wheel. Eric Martinez, a 26-year old T.G.I. 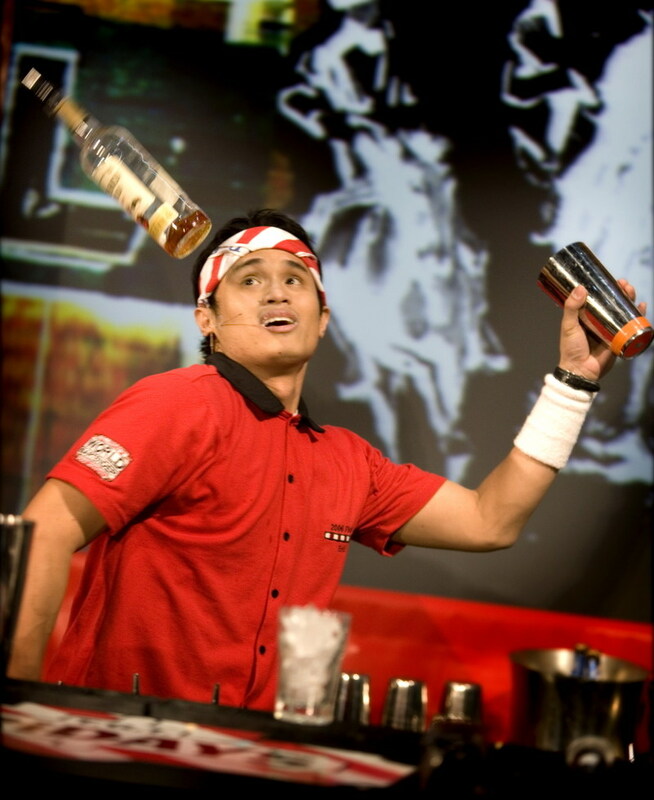 Friday's restaurants bartender from Caloocan Manila, Philippines, was crowned "Greatest Bartender in the World" at Club Rain at The Palms casino resort in Las Vegas this week, following an intense finals competition between eight of the company's best mixologists from around the globe. Brian Zachau from Minneapolis was honored for the third straight year as the US Champion. "This is a dream come true," said Martinez. "There is going to be a big party at the T.G.I. Friday's in Makati City when I come home because I am the champion of the world." Nearly 8,000 Friday's bartenders from 58 countries entered this year's World Bartender Championship. The eight finalists exhibited their knowledge and showed off their flair through months of local, regional, divisional and national competitions to reach last night's finals. "This event showcases why our bartenders have always defined the brand," said Richard Snead, president and chief executive officer of Carlson Restaurants Worldwide, parent of T.G.I. Friday's. "They entertain guests with their great personalities and their ability to demonstrate accurate and precise mixology with charisma." The finalists competed throughout the weekend in a variety of skills tests, compulsory and speed rounds, where they showed their mastery of bar mechanics, including technical knowledge and accuracy. Sunday night's freestyle segment, where the competitors showed off their flair techniques of tossing, balancing, mixing and flipping cocktails and bottles in the air, brought the crowd of close to 1500 to its feet with applause time after time. Martinez received a $10,000 cash prize, bragging rights and a place in Friday's lore as well as a propeller engraved with his name to hang above his/her home Friday's bar. The propeller is a Friday's icon which signifies the bar as the engine that drives the restaurant's energy and atmosphere. Propellers hang above the bars in all 871 T.G.I. Friday's locations worldwide. We last asked our site visitors what they thought of the proposed merger between Anheuser-Busch and InBev. Leading the results were two conflicting opinions: 30 percent said that the move would be good for the two companies and the rest of the business, while another 30 percent said it would be good just for the two big brewers but not the rest of the biz. Nearly 25 percent said it would be good for no one in the business, while eight percent each believed that either distributors, or restaurateurs and retailers, would suffer under such a deal. on their menus. More than 23 percent said they list only wine prices, while 10 percent said they list only beer prices and 5 percent said they list both beer and wine prices. We last asked readers what's the best way to get through the January business doldrums. Nearly 48 percent of respondents said using promotions was the best way, while 33 percent said innovating worked best. About 12 percent said waiting out the slump is best, while 6 percent preferred discounting. We last asked readers what they think 2006 will be best remembered for in the beverage alcohol business. Nearly 42 percent of respondents said 2006 would be best remembered as the year the beer business woke up, while 26 percent said it would be remembered as the year that wine broke through as an everyday beverage. About 19 percent thought the year would be known for the Costco V. Washington State decision, while 13 percent thought 2006 was the year that the cocktail craze peaked. At the end of 2006, we asked what was most likely to happen in 2007. You voted by 35 percent that Big Beer would continue to lose share this year. Tied for second at 24 percent were the answers "Wine in alternate packages will catch the consumer's fancy" and "Retailers will start rebelling against distributor consolidation." Twelve percent of you believe that cachaca will be the next big spirit, while nearly six percent said domestic Big Beer will bounce back this year.